I always find some time over the weekends to question or to analyze the irregularities and abnormalities of the last trading week to understand those "disturbances" somehow and, of course, to implement them into the trading plan of the following week. The relation between the silver and the gold rebound was extremely conspicuous last week. Silver performed three times better than gold. The situation: After an intense test of the support Gann Angle silver closed above it in January. Simultaneously the setup-anchored green dotted support horizontal resisted. The February low is lying exactly on the intersection point of the support Gann Angle and that very support horizontal which is a price and time magnet, or a cross support in TA terms. 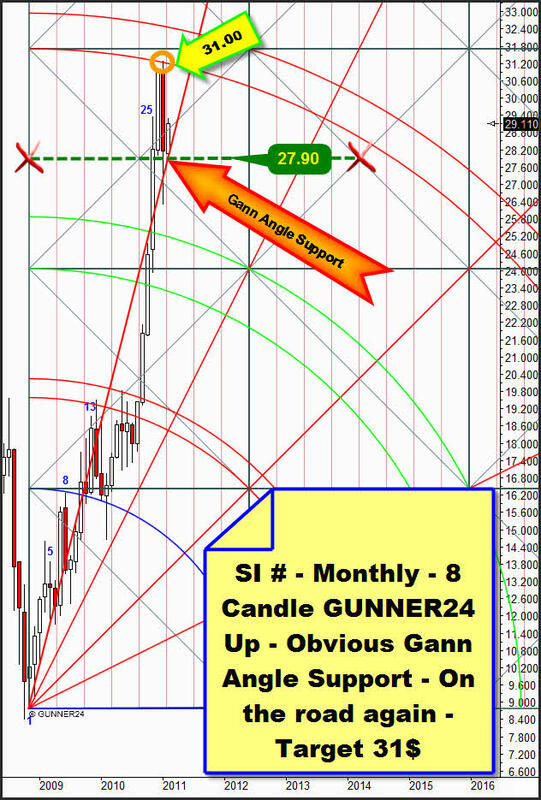 If we see a rebound from that magnet according to Gann it means A) it’s an extremely important support and B) the rebound from it cannot be ended before the next price and time magnet. Since above the price only the 3rd double arc is floating we should reach this one. So the target is 31$ for the moment. In the further course of the month we’ll have to observe the silver performance around the main target to draw more conclusions on the further possible targets. Gold is offering a far more negative impression. There are many resistances above the price making clear why gold can’t join the silver rally at one to one. On Friday, shortly before the employment numbers were published in the Gold Trader GUNNER24 prognosticated the intraday low at 1347. That was the intraday buying mark. Target for longs are 1362 since the low of 1309. And what happened… The Friday low was "only" and exactly at 1361…besides, unlike the silver, the gold future did not close near the day high. It’s the anomaly in the market mentioned at the beginning. Considering the actual monthly setup we see why intraday such a violent rebound happened exactly at 1361 (and not at 1362…). We went to a monthly resistance, in silver unfortunately such doesn’t exist anymore on this time level. Since obviously gold is expected to have a lot of important monthly resistances may be silver is going to be quoted at 30$ whereas gold is keeping on below 1361. But if the 1361 are taken the targets above should be called at quickly. Perhaps for just one day again but then another violent rebound should follow. For intraday trading that means further that rebounds from important silver resistances like last Friday should lead to even more violent rebounds in gold. Strange! 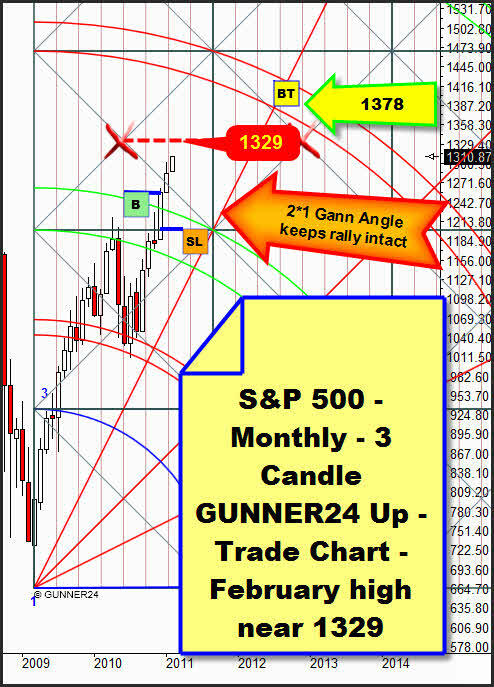 All the same in the monthly GUNNER24 Up we see that definitely a rebound at the Gann Angle support happened. Not as strong as in silver, but it did. According to Gann the price and time supports should not be broken before the fourth attempt. In the case of gold that would mean it won’t happen before March or April 2011. 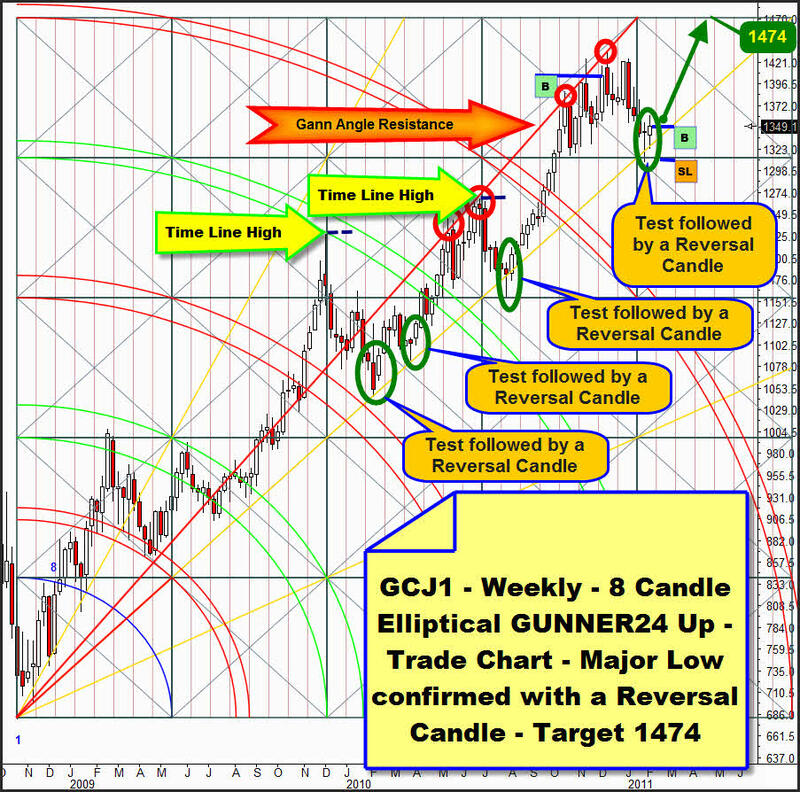 Aside from two buy signals in the daily time frame also in the weekly 8 Candle Elliptical GUNNER24 Up gold produced the reversal candle we mentioned in the last issue. At first that means also in the weekly setup we should mark another major turning point. The long entry followed by the week closing at 1349, target 1474, SL 1309. Reverse and double. So in gold we’re positioned long in all the time frames. Silver is likewise showing all the signs for resuming the long term upwards trend. "As far as I know", the GUNNER24 Forecasting Method is the globally unique and only technical analysis tool that deals intensely with the comportment of the market at support and resistance marks being able to combine that with price predictions. You’ll learn everything on these really "secret" facts in the Complete GUNNER24 Forecasting and Trading Course. Order now! Until Friday, in the US stock markets we were long only with those positions which are based on the monthly GUNNER24 Setups. In the Dow Jones we have been long at 11577 since 12/31/2010. The 12537 are the target. Since the clear break of the 2nd double arc on daily basis there are only mini-corrections lasting 2-3 days at the most which are bought at once. 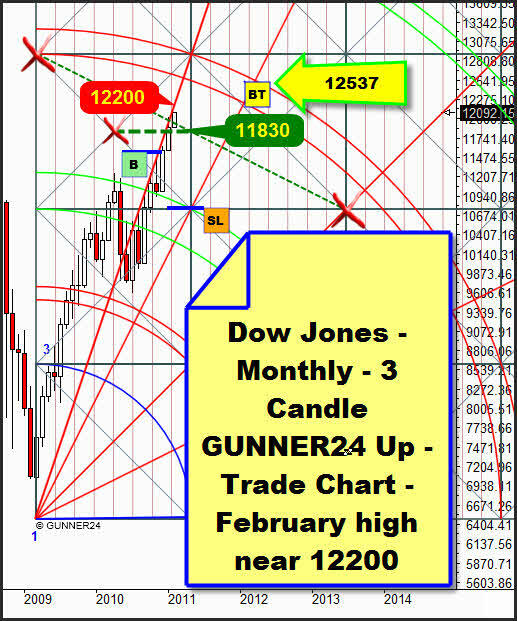 In monthly sight the Dow Jones is actually stopped only by the Resistance Gann Angle. And this is where the respective tops of the candles have been produced for months. That makes the 12200 for February obvious. There’s no other resistance to be seen. Clear road to the 12537 until April 2011! After the expected interim top at 12200 the first important support is lying at the setup-anchored support horizontal. But who knows whether it will be reached?! In case of the S&P 500 the next resistance in the actual monthly 3 Candle GUNNER24 Up Setup is not to be seen before the 1329. In terms of extension that is corresponding with the 12200 of the Dow Jones. The monthly indicators and oscillators are not nearly in the oversold area, so from that side we can’t see any obstacle either that might impede a continuation of the rally until April 2011 to the 3rd double arcs being the main targets. After a three week fight of the market for overcoming the 4th double arc which per se offers few resistance last week it was broken. At the beginning of last week the 4th double arc was tested back. That released a short signal in the daily GUNNER24 Up Setup. That meant a loss of 27 points. Furthermore also the horizontal resistance of the upper line of the 6th passed square (orange 1-6) was overcome at 1296. 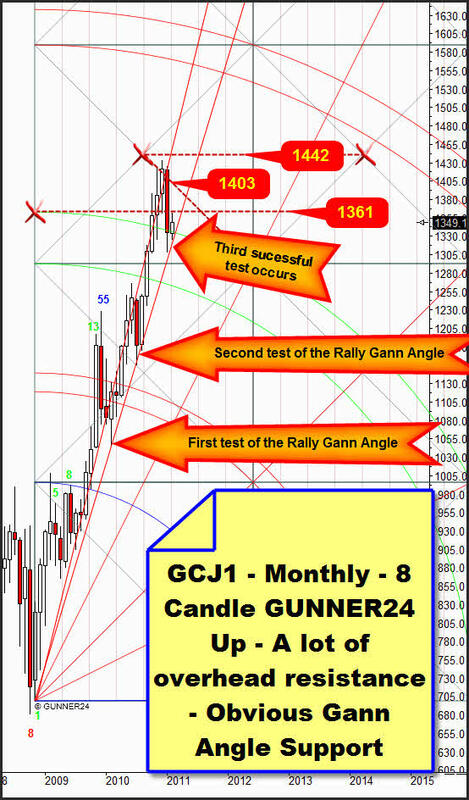 The supporting Gann Angle resisted for the repeated time being the line in the sand where the market should go on running upwards. The week closing took place at the week high. That’s a little sign of exaggeration… since the market is simultaneously parking at the Setup-anchored red dotted resistance diagonal it’s possible that Monday will rebound there to start a mini-correction again – probably. 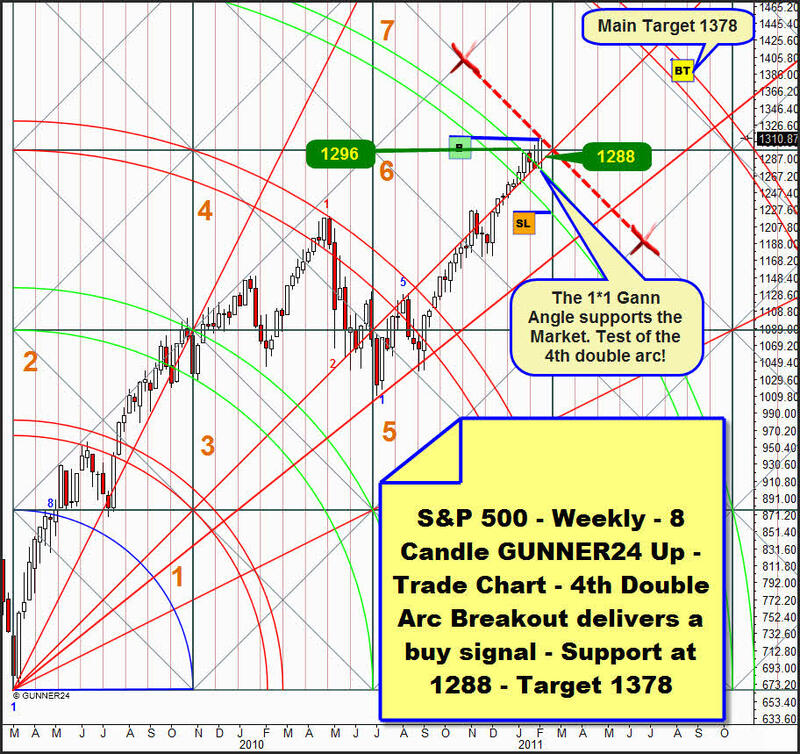 It shouldn’t go to more than 1288 (Gann Angle support). But it should rather end at 1296: The resistance horizontal should convert into a support horizontal.